It fits perfectly in bubs mouth, lightweight, so colorful which attracts bub to eat more. Easy to hold, even my baby try to eat with this spoon. 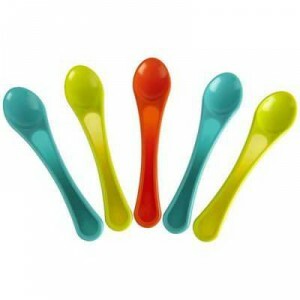 I have a container of baby spoons and still have days I can’t find one :/ love the colours of these spoons. They’re not too hard, but firmer then the new to solids spoons. Great little ones fir bub to learn to self feed. These are the Nextep up spoons. The spoons have a hard head and a very easy to grab for little hands. Great start-up spoons for baby to feed her self. How would you rate Explora Cutlery Feeding Spoons?